Entering the doors of Crothersville Elementary School, turning left and stepping into the three classrooms on the left side of the hallway, you will be greeted by young women just beginning their new careers. Keeli Bowling, 22, and Olivia Cain, 23, are the fourth-grade teachers at the school, and Natasha Lewis, 25, is the sole fifth-grade teacher. Then continuing down the hallway and crossing into the high school, you will find that building’s only new teacher, Jacob “Jay” Payne, 27. Crothersville was the first Jackson County district to start the 2018-19 school year Thursday, so as students settle in, so are these four teachers. Bowling graduated from Scottsburg High School in 2014 and then headed to Hanover College to pursue an elementary education degree. In the fall of 2017, she did her student teaching at New Washington Elementary School. At the beginning of this year, she returned to Hanover College to take her final five classes. In May, she earned her degree. Earlier this summer, she applied for a position at Crothersville, but it wound up being filled. Then Friday afternoon, Principal Drew Markel emailed her about an opening, and she was hired the next day. While that was good news, it meant she only had a few days to get her classroom ready. Bowling has 22 fourth-graders in her classroom. Growing up in Columbus, Cain said she developed an interest in becoming a teacher when she was in first grade. After graduating from Columbus North High School in 2013, she went to Purdue University with a different field of study in mind. Cain graduated from Purdue in 2017 and served as a teaching assistant at W.D. Richards Elementary School in Columbus for a semester. Then for the second semester, she was a Title I instructional assistant at Seymour-Redding Elementary School, where she did a lot of response to intervention work with kids. She found out about an opening at Crothersville through Lewis, who was a student teacher at Redding. She spent the past week getting her classroom ready for her 21 students. She met them for the first time during an open house Wednesday afternoon. Cain said she looks forward to getting to know the kids and developing relationships with the school. Lewis is the only Jackson County native among the new teachers, having grown up in Seymour..
After graduating from Seymour High School in 2011, she went to Ball State University to study nursing. After a year there, she got married and moved to upstate New York with her husband, Dustin Lewis, who was serving in the military. In 2014, after his deployment and they had their first child, they decided to move back to Indiana. Lewis said she realized her passion was teaching, so she enrolled in Ivy Tech Community College and went on to earn an associate degree in elementary education. Then she transferred to Indiana University Southeast and earned her bachelor’s degree with a concentration in social studies in May. From January to May, she was a student teacher at Seymour-Redding. She also worked at a day care in Uniontown. She sent her résumé to Crothersville a couple of times in hopes of landing a teaching job. She was offered a position in June, and the school board approved her hiring in July. Since then, she has been getting her classroom ready. Her 32 students will find a different atmosphere with the lights turned off and three floor lamps and a lava lamp on. Lewis said she’s excited about the different personalities of her students. Lewis also is coaching middle school volleyball, and she plans to work at the day care during the summer break. Payne grew up in Terre Haute and later graduated from Clay City High School in 2010. He earned a bachelor’s degree in social studies education from Indiana State University four years later, spending his last semester teaching at Sarah Scott Middle School in Terre Haute. After receiving a scholarship, he went back to Indiana State and earned a master’s degree in curriculum instruction in December. He’s now working on a master’s degree in school administration. He recently moved to New Albany with his girlfriend starting pharmacy school in Louisville, Kentucky, and was looking for a teaching job. Crothersville was the closest one, so he applied and was hired after an opening came up. Payne said he is passionate about education because growing up, he was diagnosed with a learning disability called high-functioning attention deficit hyperactivity disorder. He said he could grasp information quickly, but he would get bored and hyper in class, which distracted other students. He chose to teach social studies because the study of human history and how it has evolved has been a longtime interest. 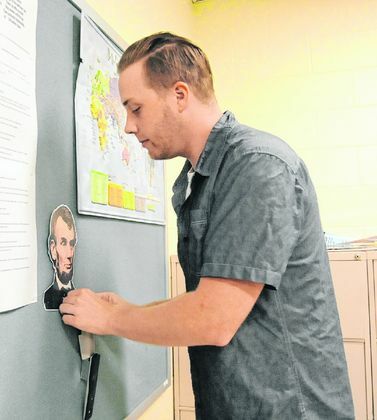 “I just felt that me being able to tell a story and then also try to come up with analogies that relate to some of the students’ interests and incorporate those within my instruction is really going to help them be engaged,” he said. This school year, he is teaching U.S. history, world history, economics, ethics, political science and Indiana government and also an eighth-grade U.S. history class. Later on, Payne said his goal is to get into school administration. “I feel like right now, I’m still in the prime of my teaching years, so I feel like to maybe do that for about five to 10 years and just have that under my belt so if an opportunity does arise, I can possibly look into that,” he said. For now, he is ready for his first year at Crothersville. “I’m excited. Go Tigers!” he said, smiling.